Sulforaphane is a phytochemical, a substance within the isothiocyanate group of organosulfur compounds, found in cruciferous vegetables, such as broccoli, cabbage, cauliflower, and Brussels sprouts. It can also be found in bok choy, kale, collards, mustard greens and watercress. Research studies have shown that sulforaphane can help prevent various types of cancer by activating the production of Nrf2, or nuclear factor erythroid 2-related factor, a transcription factor which regulates protective antioxidant mechanisms that control the cell's response to oxidants. The purpose of the following article is to describe the function of sulforaphane. The KEAP1-Nrf2-ARE antioxidant system is a principal means by which cells respond to oxidative and xenobiotic stresses. Sulforaphane (SFN), an electrophilic isothiocyanate derived from cruciferous vegetables, activates the KEAP1-Nrf2-ARE pathway and has become a molecule-of-interest in the treatment of diseases in which chronic oxidative stress plays a major etiological role. We demonstrate here that the mitochondria of cultured, human retinal pigment epithelial (RPE-1) cells treated with SFN undergo hyperfusion that is independent of both Nrf2 and its cytoplasmic inhibitor KEAP1. Mitochondrial fusion has been reported to be cytoprotective by inhibiting pore formation in mitochondria during apoptosis, and consistent with this, we show Nrf2-independent, cytoprotection of SFN-treated cells exposed to the apoptosis-inducer, staurosporine. 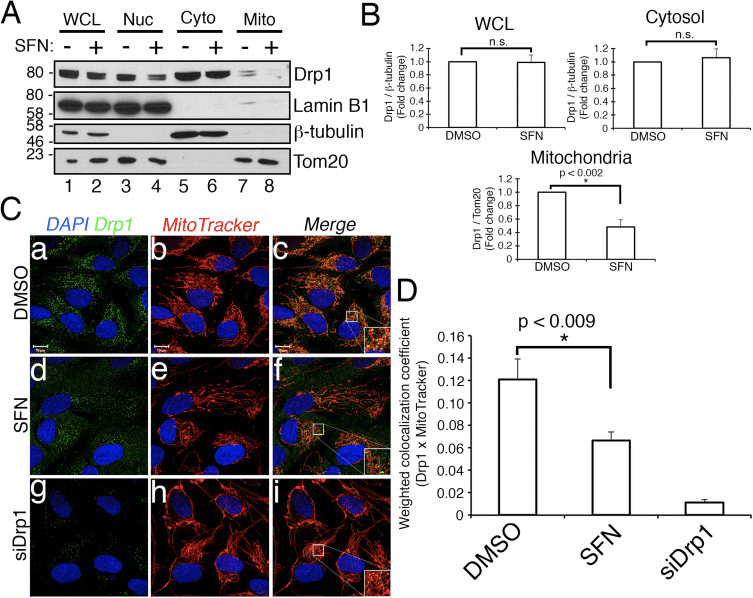 Mechanistically, SFN mitigates the recruitment and/or retention of the soluble fission factor Drp1 to mitochondria and to peroxisomes but does not affect overall Drp1 abundance. These data demonstrate that the beneficial properties of SFN extend beyond the activation of the KEAP1-Nrf2-ARE system and warrant further interrogation given the current use of this agent in multiple clinical trials. Sulforaphane (SFN) is an isothiocyanate compound derived in the diet most commonly from cruciferous vegetables . It is generated in plants as a xenobiotic response to predation via vesicular release of the hydrolytic enzyme myrosinase from damaged cells; this enzyme converts glucosinolates to isothiocyantes . Over the last two decades, SFN has been extensively characterized for its reported anticancer, antioxidant, and antimicrobial properties . Much of this efficacy has been attributed to the capacity of SFN to modulate the KEAP1-Nrf2-antioxidant response element (ARE) signaling pathway, although additional activities of the compound have been identified, including the inhibition of histone deacetylase activity and cell cycle progression . Nrf2 is the master antioxidant transcription factor and under conditions of homeostasis, its stability is suppressed through the action of the cytoplasmic Cullin3KEAP1 ubiquitin ligase complex . Specifically, Nrf2 is recruited to the Cullin3KEAP1 ligase by binding to the dimeric substrate adaptor KEAP1 and is subsequently modified with polyUb chains that target the transcription factor for proteasome-mediated degradation. This constitutive turnover limits the half-life of Nrf2 in unstressed cells to ~15 min , , , . In response to numerous types of stress, most notably oxidative stress, KEAP1, a cysteine-rich protein, acts as a redox sensor, and oxidative modification of critical cysteines, particularly C151, of KEAP1 dissociates Nrf2-KEAP1 from CUL3 thereby preventing Nrf2 degradation , , . Notably, SFN, and possibly other Nrf2 activators, mimic oxidative stress by modifying C151 of KEAP1 e.g. . Stabilization of Nrf2 allows for its translocation to the nucleus where it induces the expression of a battery of Phase II antioxidant and detoxification genes. Nrf2 binds to the antioxidant response promoter elements (ARE) of its cognate target genes through heterodimerization with small Maf proteins . This system presents a dynamic and sensitive response to indirect antioxidants like SFN, free radicals generated by the mitochondria , or other physiologic sources of oxidative stress . Mitochondria are dynamic, subcellular organelles that regulate a host of cellular functions ranging from ATP production and intracellular calcium buffering to redox regulation and apoptosis , . Mitochondria also represent the principal source of reactive oxygen species (ROS) within the cell. Proper regulation of mitochondrial function is therefore necessary for optimizing ATP production to meet cellular needs while simultaneously minimizing the potentially harmful effects of excessive free radical production. A critical requirement for fine modulation of mitochondrial function is the capacity for mitochondria to function both independently as biochemical machines and as part of a vast, responsive network. Mitochondrial network morphology and function are determined by a regulated balance between fission and fusion. Mitochondrial fission is required for daughter cell inheritance of mitochondria during cell division  as well as for the selective, autophagic degradation of depolarized or damaged mitochondria, termed mitophagy . Conversely, fusion is required for complementation of mitochondrial genomes and sharing of electron transport chain components between neighboring mitochondria . At the molecular level, mitochondrial fission and fusion are regulated by large, dynamin-like GTPases. Three enzymes primarily regulate fusion: Mitofusins 1 and 2 (Mfn1/2) are two-pass outer membrane proteins that mediate outer membrane fusion via heterotypic interactions between adjacent mitochondria , , , while OPA1 is an inner membrane protein that simultaneously ensures matrix connectivity by regulating the melding of inner membranes . 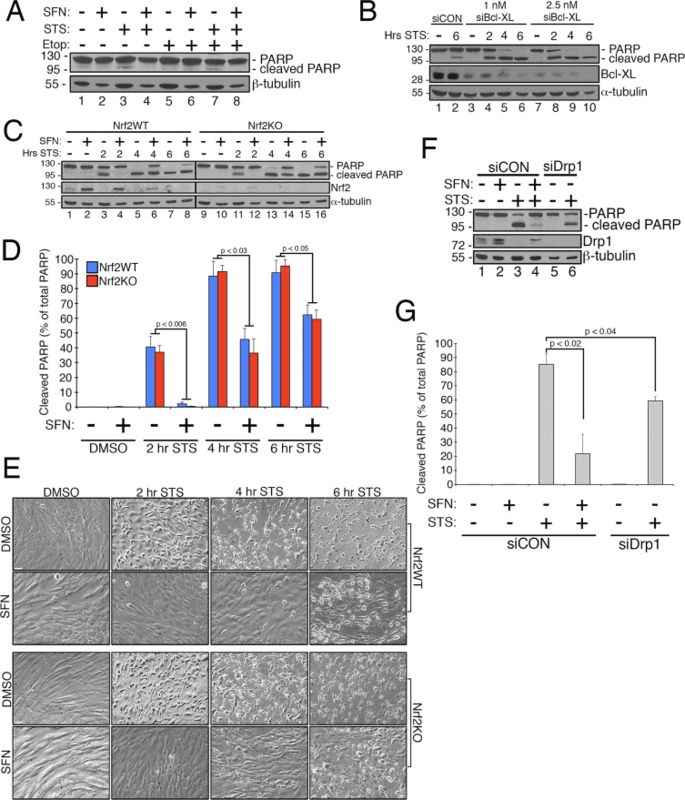 The GTPase activity of all three proteins is required for robust fusion , , and OPA1 is further regulated by complex proteolysis within the mitochondrial inner membrane by the proteases OMA1 , PARL , and YME1L . Importantly, intact mitochondrial membrane potential is required for efficient fusion in order to suppress integration of damaged and healthy mitochondria . Mitochondrial fission is primarily catalyzed by a cytosolic protein called Dynamin-related protein 1 (Drp1/DNM1L). Drp1 is recruited from the cytosol to prospective sites of fission on the mitochondrial outer membrane . The major receptors for Drp1 on the outer membrane are mitochondrial fission factor (Mff)  and, to a lesser extent, Fission 1 (Fis1) . Additionally, a decoy receptor, MIEF1/MiD51, was discovered that acts to further limit the activity of Drp1 protein at potential fission sites . Once docked at the mitochondrial outer membrane, Drp1 oligomerizes into spiral-like structures around the body of the mitochondrion and then utilizes the energy derived from GTP hydrolysis to mediate the physical scission of the mitochondrial outer and inner membranes . Endoplasmic reticulum-derived tubules act as an initial constrictor of mitochondria prior to Drp1 oligomerization, underscoring the revelation that non-constricted mitochondria are wider than the permissive circumference of a completed Drp1 spiral . Actin dynamics are also important for the ER-mitochondria interactions that precede mitochondrial fission . In addition to its role in mitochondrial fission, Drp1 catalyzes the fission of peroxisomes . Drp1 is very similar to the well-characterized dynamin protein in that both proteins contain an N-terminal GTPase domain, a Middle domain that is critical for self-oligomerization, and a C-terminal GTPase effector domain . Drp1 achieves selectivity for mitochondrial membranes through a combination of interactions with its receptor proteins Mff and Fis1 and also through its affinity for the mitochondria-specific phospholipid cardiolipin via the unique B-insert domain of Drp1 . Drp1 typically exists as a homotetramer in the cytoplasm, and higher order assembly at mitochondrial fission sites is mediated by the Middle domain of Drp1 . Given the implicit link between mitochondrial function and the KEAP1-Nrf2-ARE pathway, we investigated the effects of Nrf2 activation on mitochondrial structure and function. We demonstrate here that SFN induces mitochondrial hyperfusion that, unexpectedly, is independent of both Nrf2 and KEAP1. This effect of SFN is through an inhibition of Drp1 function. We further demonstrate that SFN confers resistance to apoptosis that is Nrf2-independent and mimics that observed in cells depleted of Drp1. These data collectively indicate that in addition to stabilizing and activating Nrf2, SFN modulates mitochondrial dynamics and preserves cellular fitness and survival. In the course of studying the effects of Nrf2 activation on mitochondrial network dynamics, we discovered that treatment of immortalized, human retinal pigment epithelial (RPE-1) cells with sulforaphane (SFN), a potent activator of Nrf2 signaling, induced a robust fusion of the mitochondrial network when compared with vehicle-treated control cells (Fig. 1A and B). The morphology of the mitochondria in these cells greatly resembled that of the mitochondria in cells depleted by siRNA of endogenous Drp1, the principal mitochondrial fission factor (Fig. 1A). This result raised the intriguing idea that mitochondrial fission and fusion status responds directly to Nrf2 levels in the cell. However, stimulation of cells with other Nrf2 stabilizers and activators such as the proteasome inhibitor MG132, the pro-oxidant tBHQ, or knockdown of the Nrf2 inhibitor KEAP1 did not induce mitochondrial fusion (Fig. 1A and B). Stabilization of Nrf2 by these manipulations was confirmed by western blotting for endogenous Nrf2 (Fig. 1C). Furthermore, expression of Nrf2 was dispensable for SFN-induced mitochondrial fusion, as knockdown of endogenous Nrf2 with siRNA failed to counter this phenotype (Fig. 1D–F). Because SFN stimulates the KEAP1-Nrf2-ARE pathway by covalently modifying cysteine residues of KEAP1 , we knocked down KEAP1 to address whether SFN-induced mitochondrial hyperfusion is stimulated through a KEAP1-dependent, but Nrf2 independent pathway. 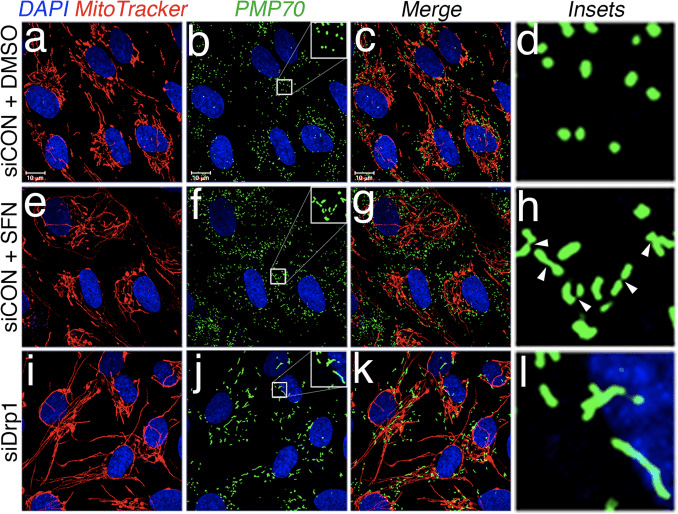 However, depletion of KEAP1 also failed to abrogate SFN-induced mitochondrial fusion (Fig. 1G–I). In fact, SFN reversed the pro-fission morphology induced by depletion of KEAP1 (Fig. 1G, panel b versus panel d). 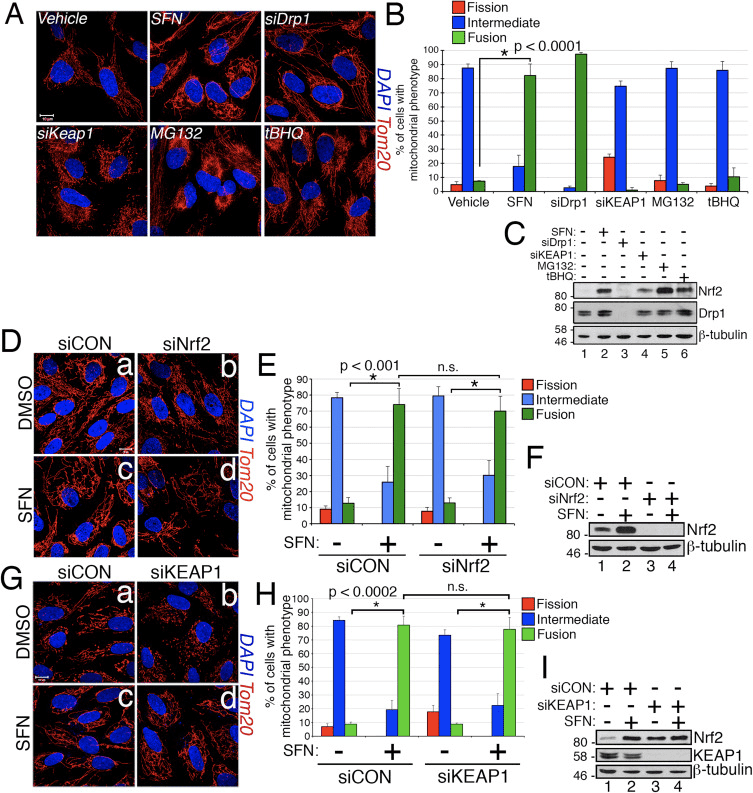 These results indicate that SFN treatment causes mitochondrial fusion independent of the canonical KEAP1-Nrf2-ARE pathway and led us to interrogate whether SFN directly affects components of the mitochondrial fission or fusion machinery. Figure 1 SFN induces Nrf2/KEAP1-independent mitochondrial fusion. (A) RPE-1 cells were transfected with the indicated siRNAs and 3 days later treated with DMSO or the Nrf2 activators SFN (50 μM), MG132 (10 μM), or tBHQ (100 μM) for 4 h. Mitochondria (red) are labeled with an anti-Tom20 antibody, and nuclei (blue) are counterstained with DAPI. (B) Graph showing quantification of mitochondrial morphology scoring from (A). >50 cells per condition were evaluated in a blinded fashion. (C) Representative western blots from (A). (D) RPE-1 cells were transfected with 10 nM siRNA and 3 days later treated with SFN for 4 h prior to being fixed and stained as in (A). (E) Graph showing quantification of mitochondrial phenotype scoring from (D). >100 cells per condition were evaluated in a blinded fashion. (F) Representative western blots from (D). (G) Cells were transfected and treated as in (D) with siCON or siKEAP1. (H) Cells from (G) were scored as in (B) and (E) on the basis of mitochondrial morphology. (I) Representative western blots from (G). Data in (B), (E), and (H) were compiled from 3 independent experiments each and statistical significance was determined by two-tailed Student's t-test. Error bars reflect +/- S.D. (For interpretation of the references to color in this figure legend, the reader is referred to the web version of this article). Based on the finding that SFN-treatment induces mitochondrial hyperfusion, we reasoned that this phenotype was either a consequence of excessive fusion activity or an inhibition of fission activity. To discriminate between these two possibilities, we compared the morphology of peroxisomes in the presence and absence of SFN. Peroxisomes are similar to mitochondria in that they are dynamic organelles the shape and length of which are constantly in flux . Peroxisomes contain both Fis1 and Mff in their outer membrane and, as a consequence, are targets for Drp1-mediated fission , . However, peroxisomes do not utilize the fusion machinery of the mitochondrial network and consequently, do not undergo fusion . Rather, peroxisomal fission is opposed by the lengthening of existing peroxisomes via de novo addition of membranes and proteins . Because peroxisomes lack Mfn1/2 and OPA1, we reasoned that if SFN activates the fusion machinery rather than inhibiting the fission machinery, peroxisome length would not be affected. In vehicle-treated cells, peroxisomes are maintained as short, round, punctiform organelles (Fig. 2, panels b and d). However, SFN treatment increased peroxisome length by ~2-fold as compared to control cells (Fig. 2, panels f and h). Furthermore, many of the peroxisomes were pinched near the center, indicating a potential scission defect (Fig. 2, panel h, arrowheads). Likewise, peroxisomes in cells transfected with Drp1 siRNA were abnormally long (Fig. 2, panels j and l), confirming that Drp1 is required for peroxisomal fission and suggesting that SFN-treatment causes mitochondrial and peroxisomal phenotypes by disrupting the fission machinery. Figure 2 SFN induces peroxisomal lengthening. (A) RPE-1 cells were transfected with 10 nM of the indicated siRNA and 3 days later treated with DMSO or 50 μM SFN for 4 h. Peroxisomes (green) were labeled with an anti-PMP70 antibody, mitochondria with MitoTracker (red), and DNA counterstained with DAPI. Enlarged insets of peroxisomes are shown on the right (panels d, h, and l) to facilitate visualization of the changes in morphology induced by SFN and Drp1 depletion. Arrowheads highlight constriction points. (For interpretation of the references to color in this figure legend, the reader is referred to the web version of this article). We next determined how SFN restricts Drp1 function. Possibilities included reductions in expression levels, recruitment/retention at mitochondria, oligomerization, or enzymatic activity of the GTPase. A deficit in any one of these would result in reduced mitochondrial fission and hyperfusion. We did not detect reproducible changes in Drp1 protein levels after SFN-treatment (Figs. 1C and 3A), and therefore concluded that SFN does not alter Drp1 stability or expression, consistent with Drp1 having a half-life of >10 h  and our SFN treatments being of shorter duration. Next, we investigated whether SFN affected the recruitment or retention of Drp1 to mitochondria. Fractionation studies showed that SFN induced a loss of Drp1 from the mitochondrial fraction (Fig. 3A, lanes 7–8 and Fig. 3B). As reported previously , only a minor fraction of Drp1 (~3%) is associated with the mitochondrial network at any given time during steady state conditions with most of the enzyme residing in the cytoplasm (Fig. 3A, lanes 5–8). These fractionation data were confirmed using co-localization analysis which showed a ~40% reduction in mitochondria-localized, punctate Drp1 foci after SFN-treatment (Fig. 3C and D). Together, these data indicate that the mitochondrial fusion induced by SFN is, at least partially, due to the attenuated association of Drp1 with the mitochondria. Our data do not distinguish between whether SFN interferes with the mitochondrial recruitment versus the mitochondrial retention of Drp1, or both, as the analysis of endogenous Drp1 was not amenable to visualizing the GTPase by live-cell microscopy. Figure 3 SFN causes a loss of Drp1 from the mitochondria. (A) Subcellular fractionation of RPE-1 cells following 4 h of DMSO or SFN. Whole-cell lysates (WCL), nuclear (Nuc), cytosolic (Cyto), and crude mitochondrial (Mito) fractions were resolved by SDS-PAGE and processed for western blotting with the indicated antibodies. The migration of molecular weight markers is indicated on the left. (B) Graphs showing densitometric quantification of Drp1 in the indicated fractions from (A). (C) RPE-1 cells were transfected with 10 nM siCON or siDrp1 and 3 days later treated with DMSO or SFN for 4 h. Drp1 (green) was visualized with an anti-Drp1 antibody, mitochondria with MitoTracker (red), and nuclei with DAPI (blue). (D) Automated co-localization analysis of Drp1 and MitoTracker signal from (C). Data in (B) and (D) were compiled from 3 and 5 independent experiments, respectively, and statistical significance was determined by two-tailed Student's t-test. Error bars reflect +/- S.D and asterisks denote statistical significance. (For interpretation of the references to color in this figure legend, the reader is referred to the web version of this article). Previous work has shown that mitochondrial fission is permissive in the formation of pores in the outer mitochondrial membrane generated by Bax/Bak during apoptosis . Drp1 has been shown to be selectively recruited to mitochondria during apoptosis  and, consistent with this, fragmented mitochondria have been observed early in the process . Conversely, inhibiting mitochondrial fission is thought to inhibit apoptosis by blocking the formation of the outer membrane pores that allow for cytochrome c release . Accordingly, stimulating mitochondrial fusion delays the progression of apoptosis induced by compounds including staurosporine (STS) . To determine whether SFN protects RPE-1 cells from STS-mediated apoptosis and if so, whether this requires Nrf2, we established an assay to readily induce poly ADP ribose polymerase (PARP) cleavage, a substrate of activated caspase-3 and definitive marker of apoptosis. Treatment of RPE-1 cells with 1 µM STS for 6 h only caused a very modest cleavage of PARP yet this was prevented by SFN co-treatment (e.g., Fig. 4A, lane 3 versus 4). To increase the robustness of this assay, we further sensitized cells to STS-induced apoptosis by pre-treating them with siRNA targeting the anti-apoptotic factor, Bcl-XL. This pretreatment reduced the expression of Bcl-XL and markedly promoted PARP cleavage as a function of time exposed to STS (Fig. 4B, compare lane 2 to lanes 4–10). Importantly, 2 h of pre-treatment with SFN mitigated PARP cleavage in cells exposed to STS (Fig. 4C, lane 3 versus 4 and lane 5 versus 6). Likewise, cells stably depleted of Nrf2 by CRISPR/Cas9 were comparably protected from STS toxicity by SFN pre-treatment (Fig. 4C, lane 11 versus 12 and lane 13 versus 14 and Fig. 4D). This protection was observed using both PARP cleavage (Fig. 4C and D) and cellular morphology (Fig. 4E) as readouts. The efficacy of Nrf2 depletion by CRISPR/Cas9 was confirmed by western blotting (Fig. 4C, Nrf2 blot). As predicted, depleting cells of Drp1, which also yields a hyperfusion phenotype (Fig. 1A), also blocked PARP cleavage in response to STS as compared to control cells incubated with SFN (Fig. 4F and G). Together, these findings are consistent with SFN conferring protection against apoptosis through its capacity to restrict Drp1 function, independent of the stabilization and activation of Nrf2. Figure 4 The cytoprotective effects of SFN are independent of Nrf2 expression (A) RPE-1 cells were pre-treated with DMSO or 50 μM SFN for 2 h prior to treatment with DMSO, 1 μM staurosporine (STS), or 50 μM etoposide for 6 h and were processed for anti-PARP western blotting. (B) RPE-1 cells were transfected with 2.5 nM siCON, 1 nM siBcl-XL, or 2.5 nM siBcl-XL and 3 days later were treated with DMSO or 1 μM STS for 2, 4, or 6 h. Representative western blots are shown and the migration of molecular weight markers is indicated on the left. (C) CRISPR/Cas9-generated wild-type (Nrf2WT) and Nrf2 knockout (Nrf2KO) RPE-1 cells were transfected with 1 nM siBcl-XL and 3 days later were pre-treated with DMSO or 50 μM SFN for 2 h. Subsequently, the cells were treated with 1 μM STS for 2, 4, or 6 h. Representative western blots with the indicated antibodies are shown. (D) Quantification of cleaved PARP as a percentage of total PARP (cleaved+uncleaved) from 3 independent experiments. Importantly, the levels of cleaved PARP were comparable whether cells expressed Nrf2 or not, indicating that SFN protection from STS is independent of the transcription factor. (E) 20X phase-contrast images taken immediately prior to harvest of lysates from (C). Scale bar=65 µm. (F) Representative western blots demonstrating that depletion of Drp1 confers near-comparable protection from STS as SFN treatment. RPE-1 cells were transfected with 1 nM siBcl-XL and additionally transfected with either 10 nM siCON or 10 nM siDrp1. 3 days later, siCON cells were pre-treated with SFN as in (A) and (C) and then exposed to STS for 4 h prior to being harvested and processed for western blotting with the indicated antibodies. (G) Same as (D) for the data presented in (F) compiled from 3 independent experiments. Error bars reflect +/- S.E.M. We have discovered that SFN modulates mitochondrial fission/fusion dynamics independent of its effects on the KEAP1-Nrf2-ARE pathway. This is intriguing because of an assumed link between mitochondrial dysfunction and ROS production and the necessity of squelching mitochondria-derived free radicals through the activation of Nrf2. This additional functional impact of SFN is of potential importance given the more than 30 clinical trials currently underway testing SFN for the treatment of a variety of diseases including prostate cancer, obstructive pulmonary disease, and sickle cell disease , , . Because SFN is an isothiocyanate  and it activates Nrf2 signaling by directly acylating critical KEAP1 cysteines to suppress Nrf2 degradation , it follows that SFN exerts its pro-fusion effects by modulating the activity of a fission or fusion factor via cysteine modification. Our data strongly support Drp1 being negatively regulated by SFN although whether the GTPase is a direct target of acylation remains to be elucidated. Despite this knowledge gap, the function of Drp1 is clearly being compromised by SFN as both mitochondria and peroxisomes become hyperfused in response to SFN treatment and these organelles share Drp1 for their respective scission events . In addition, SFN decreases the amount of Drp1 that localizes and accumulates at mitochondria (Fig. 3). Because our experiments were done with all endogenous proteins, our detection of Drp1 at mitochondrial fission sites is under steady-state conditions, and consequently, we cannot distinguish between a recruitment versus a retention defect of the enzyme caused by SFN. Further, we cannot eliminate the possibility that SFN acylates a receptor at the mitochondria (Fis1 or Mff) to block Drp1 recruitment yet, we suspect that Drp1 is directly modified. Drp1 has nine cysteines, eight of which reside within the Middle Domain that is required for oligomerization , and one of which resides in the GTPase Effector Domain (GED) at the C-terminus of Drp1. Direct acylation of any of these cysteines could cause an activity defect in Drp1 and therefore underlie the effect of SFN on mitochondrial dynamics. Notably, prior work suggests that defects in oligomerization and catalytic activity can abrogate the retention of Drp1 at the mitochondria . Cys644 in the GED domain is a particularly attractive target based on previous work showing that mutation of this cysteine phenocopies mutations that impair Drp1 GTPase activity  and that this particular cysteine is modified by thiol-reactive electrophiles . Resolution of this outstanding question will require mass spectrometric validation. In summary, we have identified a novel, cytoprotective function for the clinically-relevant compound SFN. In addition to activating the master anti-oxidant transcription factor Nrf2, SFN promotes mitochondrial and peroxisomal fusion, and this effect is independent of Nrf2. The mechanism underlying this phenomenon involves a reduction in the function of the GTPase Drp1, the primary mediator of mitochondrial and peroxisomal fission. A major consequence of SFN-mediated mitochondrial fusion is that cells become resistant to the toxic effects of the apoptosis inducer staurosporine. This additional cytoprotective action of SFN could be of particular clinical utility in the numerous neurodegenerative diseases for which age is the leading risk factor (e.g., Parkinson's Disease, Alzheimer's Disease, Age-related Macular Degeneration) as these maladies have been associated with apoptosis and reduced levels and/or dysregulation of Nrf2 , , . Together, these data demonstrate that the cytoprotective properties of SFN extend beyond activation of the KEAP1-Nrf2-ARE system and warrant further studies given the current use of this agent in multiple clinical trials. Cells were seeded and transfected with siRNA as indicated below. The cells were pre-treated with 50 μM sulforaphane for 2 h to induce mitochondrial fusion and were then treated with 1 μM staurosporine to induce apoptosis. At the time of harvest, media was collected in individual tubes and subjected to high speed centrifugation to pellet apoptotic cells. This cell pellet was combined with adherent cells and solubilized in 2 times-concentrated Laemmli buffer. Samples were subjected to anti-PARP western blotting. To create LentiCRISPR/eCas9 1.1, LentiCRISPR v2 (addgene #52961) was first cut with Age1 and BamH1. Next, SpCas9 from eSpCas9 1.1 (addgene #71814) was PCR amplified with Age1 and BamH1 overhangs using the following primers (Forward AGCGCACCGGTTCTAGAGCGCTGCCACCATGGACTATAAGGACCACGAC, Reverse AAGCGCGGATCCCTTTTTCTTTTTTGCCTGGCCGG) and ligated into the cut vector above. sgRNA sequences were determined by using Benchling.com. Parameters were set to target the coding sequence with the highest on-target and lowest off-target scores. The following sequences (targeting sequence underlined, hs sgNFE2L2#1 sense CACCGCGACGGAAAGAGTATGAGC, antisense AAACGCTCATACTCTTTCCGTCGC; hs sgNFE2L2#2 sense CACCGGTTTCTGACTGGATGTGCT, antisense AAACAGCACATCCAGTCAGAAACC; hs sgNFE2L2#3 sense CACCGGAGTAGTTGGCAGATCCAC, antisense AAACGTGGATCTGCCAACTACTCC) were annealed and ligated into BsmB1 cut LentiCRISPR/eCas9 1.1. Lentivirally infected RPE-1 cells were selected with puromycin and maintained as a pooled population. Knockout was confirmed by immunofluorescence and western blotting. Human retinal pigment epithelial cells transformed with telomerase (RPE-1) (ATCC) were cultured in Dulbecco's Modified Eagle Medium (DMEM) containing 1 g/L glucose supplemented with penicillin, streptomycin, 1X non-essential amino acid cocktail (Life Technologies), and 10% Fetal Bovine Serum (Life Technologies). For siRNA-transfections, 30,000–35,000 cells/mL were seeded overnight. Cells received 10 nM siRNA diluted in serum-free DMEM and combined with 0.3% Interferin transfection reagent (PolyPlus). For apoptosis sensitization, cells received 1 nM Bcl-XL siRNA. Cells were harvested 2–3 days post-transfection. Antibodies against α-tubulin (Cell Signaling), β-tubulin (Sigma), Drp1 (BD Biosciences), KEAP1 (Proteintech), Lamin B1 (Abcam), PARP (Cell Signaling), PMP70 (Abcam), and Tom20 (BD Biosciences) were used at 1:1000 dilutions for western blotting and for immunofluorescence. In-house, anti-Nrf2 rabbit antibody was used at 1:2000 for western blotting , . Sulforaphane (Sigma) and staurosporine (Tocris) were used at 50 μM and 1 μM respectively. siRNAs against Drp1 (Dharmacon), Nrf2 (Dharmacon), KEAP1 (Cell Signaling), and Bcl-XL (Cell Signaling) were used at 10 nM unless otherwise noted. Cells seeded on 18 mm glass coverslips were treated with vehicle or drug, fixed in 3.7% formaldehyde and then permeabilized in 0.2% Triton X-100/PBS on ice for 10 min. Primary antibodies were incubated in 3% bovine serum albumin (BSA) in PBS overnight at 4 °C. Following PBS washes, cells were incubated for 1 h in species-appropriate, Alexa488- or Alexa546-, conjugated secondary antibodies (diluted 1:1000) and 0.1 μg/mL DAPI (Sigma) in 3% BSA/PBS. Mitochondria were visualized either by anti-Tom20 immunofluorescence or by incubating cells in 200 nM MitoTracker Red CMXRos (Molecular Probes, Inc.) in serum-free DMEM for 30 min at 37 °C prior to fixation. Immunofluorescence samples were viewed on an LSM710 Confocal microscope (Carl Zeiss). Micrographs were captured using 63X or 100X oil immersion objectives and images adjusted and enhanced using Adobe Photoshop CS6. Co-localization analysis was performed using Carl Zeiss LSM710 co-localization feature with thresholds manually set while blinded to the identity of the samples. Scale bars throughout, unless otherwise indicated, are 10 µm. Mitochondrial morphology was assessed by blinded scoring. If the mitochondria of a cell were maintained as multiple, round, discriminate puncta, the cell was scored as ‘fission’. If individual mitochondria were indistinguishable and the whole mitochondrial network appeared continuous, the cell was scored as ‘fusion’. All other cells, including those with clustering mitochondria, were scored as ‘intermediate’. RPE-1 cells were grown to confluence. Following a PBS wash, cells were subjected to centrifugation at 600×g for 10 min and resuspended in 600 μL isolation buffer (210 mM Mannitol, 70 mM Sucrose, 5 mM MOPS, 1 mM EDTA pH 7.4+1 mM PMSF). The suspension was lysed 30 times in a Dounce homogenizer. A fraction of the homogenate was preserved as a “whole cell lysate.” The remainder was subjected to centrifugation at 800×g for 10 min to pellet nuclei. Supernatants were subjected to centrifugation at 1500×g for 10 min to clear remaining nuclei and unlysed cells. This supernatant was subjected to centrifugation at 15,000×g for 15 min to pellet mitochondria. The supernatant was preserved as the “cytosolic fraction”. The pellet was washed gently with PBS and resuspended in isolation buffer. The protein concentration of each fraction was measured by bicinchoninic acid (BCA) assay and equivalent amounts of protein were resolved by SDS-PAGE. Cells were washed in PBS and solubilized in 2 times concentrated Laemmli solubilizing buffer (100 mM Tris [pH 6.8], 2% SDS, 0.008% bromophenol blue, 2% 2-mercaptoethanol, 26.3% glycerol, and 0.001% Pyrinin Y). Lysates were boiled for 5 min prior to loading on sodium dodecyl sulfate (SDS) polyacrylamide gels. Proteins were transferred to nitrocellulose membranes and the membranes were blocked for 1 h in 5% Milk/TBST. Primary antibodies were diluted in 5% Milk/TBST and incubated with the blot overnight at 4 °C. Horseradish peroxidase (HRP)-conjugated secondary antibodies were diluted in 5% Milk/TBST. Blots were processed with enhanced chemiluminescence and densitometric quantifications were performed using ImageJ software. 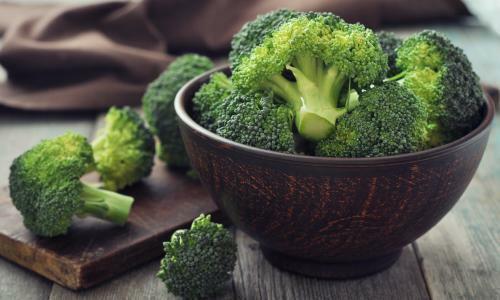 Sulforaphane is a chemical from the isothiocyanate collection of organosulfur substances obtained from cruciferous vegetables, including broccoli, cabbage, cauliflower, kale, and collards, among others. Sulforaphane is produced when the enzyme myrosinase transforms glucoraphanin, a glucosinolate, into sulforaphane, also known as sulforaphane-glucosinolate. Broccoli sprouts and cauliflower have the highest concentration of glucoraphanin or the precursor to sulforaphane. Research studies have demonstrated that sulforaphane enhances the human body's antioxidant capabilities to prevent various health issues. Sulforaphane, an isothiocyanate from broccoli, is one of the most potent food-derived anticarcinogens. This compound is not present in the intact vegetable, rather it is formed from its glucosinolate precursor, glucoraphanin, by the action of myrosinase, a thioglucosidase enzyme, when broccoli tissue is crushed or chewed. However, a number of studies have demonstrated that sulforaphane yield from glucoraphanin is low, and that a non-bioactive nitrile analog, sulforaphane nitrile, is the primary hydrolysis product when plant tissue is crushed at room temperature. Recent evidence suggests that in Arabidopsis, nitrile formation from glucosinolates is controlled by a heat-sensitive protein, epithiospecifier protein (ESP), a non-catalytic cofactor of myrosinase. Our objectives were to examine the effects of heating broccoli florets and sprouts on sulforaphane and sulforaphane nitrile formation, to determine if broccoli contains ESP activity, then to correlate heat-dependent changes in ESP activity, sulforaphane content and bioactivity, as measured by induction of the phase II detoxification enzyme quinone reductase (QR) in cell culture. Heating fresh broccoli florets or broccoli sprouts to 60 °C prior to homogenization simultaneously increased sulforaphane formation and decreased sulforaphane nitrile formation. A significant loss of ESP activity paralleled the decrease in sulforaphane nitrile formation. Heating to 70 °C and above decreased the formation of both products in broccoli florets, but not in broccoli sprouts. The induction of QR in cultured mouse hepatoma Hepa lclc7 cells paralleled increases in sulforaphane formation. Pre-heating broccoli florets and sprouts to 60 °C significantly increased the myrosinase-catalyzed formation of sulforaphane (SF) in vegetable tissue extracts after crushing. This was associated with decreases in sulforaphane nitrile (SF Nitrile) formation and epithiospecifier protein (ESP) activity. In conclusion, sulforaphane is a phytochemical found in broccoli,and other cruciferous vegetables. An uncontrolled amount of oxidants caused by both internal and external factors can cause oxidative stress in the human body which may ultimately lead to a variety of health issues. Sulforaphane can activate the production of Nrf2, a transcription factor that helps regulate protective antioxidant mechanisms that control the cell's response to oxidants. The scope of our information is limited to chiropractic and spinal health issues. To discuss the subject matter, please feel free to ask Dr. Jimenez or contact us at 915-850-0900 .